WordPress “Settings” available in admin panel is one of the least looked and most searched option by webmasters. Starting from setting a static front page to hiding entire site from search engines, it is common among users to search in Google rather than take some time to look into the “Settings” panel where most of things are readymade available. 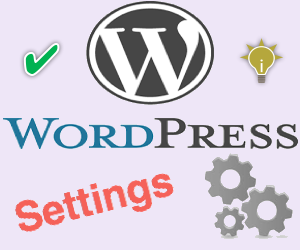 In this article we explore various WordPress settings possible under “Settings” panel. Learn 5 Admin panel settings every WordPress beginners should know. Following are the default settings available and you may see additional settings based on the installed plugins. 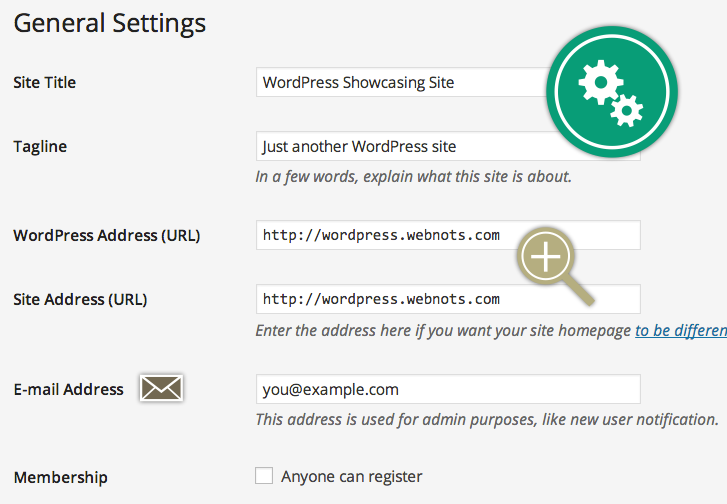 General settings allow you to set the WordPress login URL and site’s home page URL. Entering incorrect URLs will result in not able to login to your WordPress dashboard or 404 page not found error when accessing your site. Membership option allows you to add “Register” link in your login URL so that anyone can register for your site. Read our article on how to stop new user registration emails in WordPress. The timezone and date format set here will be used for all display are schedule activities on your site. Writing settings offers you to choose default category and post format for your site. If you do not assign any category to your post then the default category chosen here will be used. Use “Press This” bookmarking tool to grab content from any web page and link to your blog post. You also can setup email account for sending post to your WordPress site directly from your email inbox. The content sent will be published with the default mail category. Update services allow you to ping search engines whenever new content is published on your blog. 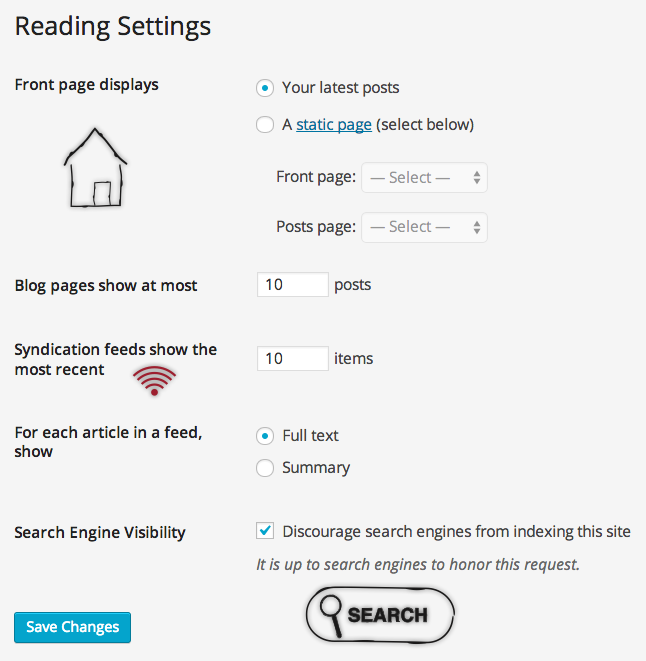 If your site is hidden from search engines set in “Reading” section then this setting is disabled by default. Reading settings allows you to choose the font page for your site which can be either a static front page or your blog posts. You can also set maximum number of posts to be displayed in each blog page and control the display of your blog feed. Setting the option “Discourage search engines from indexing this site” will request search engines not to index the site. Here are the settings to control the comments at site level and some of these options can be overwritten based on your post level settings. 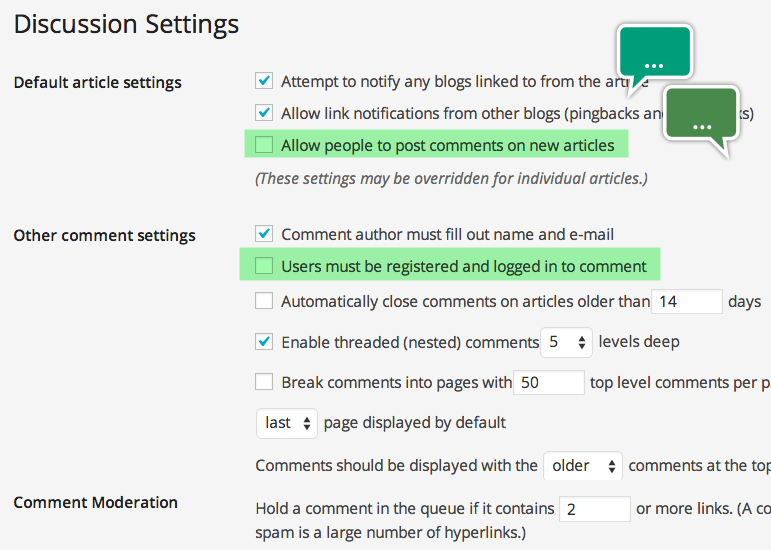 For example, you can completely disable comments here and then activate only for a particular blog post in post editor. Enable or disable comments on new article. Make registration mandatory for commenting. Automatic comments closure after selected days. Display of comments either older or newer first. Comment moderation based on number of links. Blacklist words to identify comments for moderation and spam. Set an avatar image for guest comments. WordPress will generate three set of thumbnails based on the settings here. If you use one of the default WordPress theme like Twenty Fourteen then you can customize the size of thumbnails here. If you use any other theme then these thumbnails will simply increase your file count and hence you can make the dimensions to 0 to deactivate. Learn more about reducing number of thumbnails in WordPress. Check out our article on how to change the media upload directory. This is one of the most used and important settings in WordPress. Permalinks are shot form for permanent links and help to change the numeric URL to a descriptive one so that users and search engines can understand your site content better. 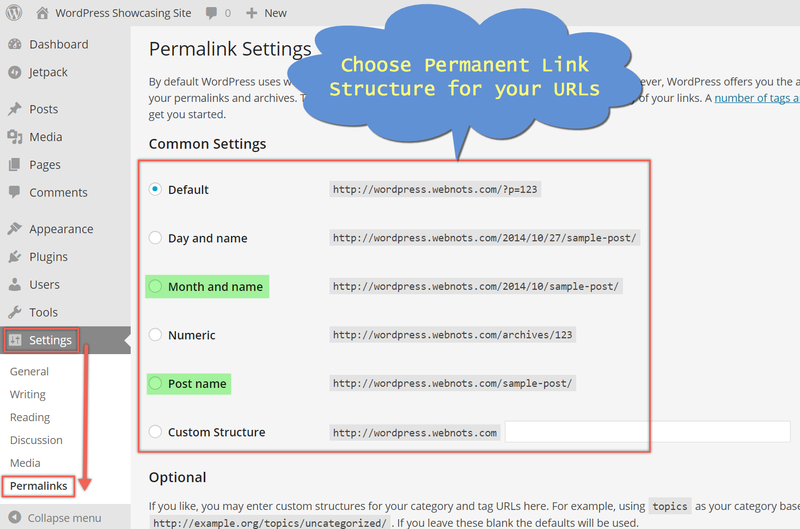 The first step after installing WordPress is to choose an appropriate permalinks structure needed for your site. 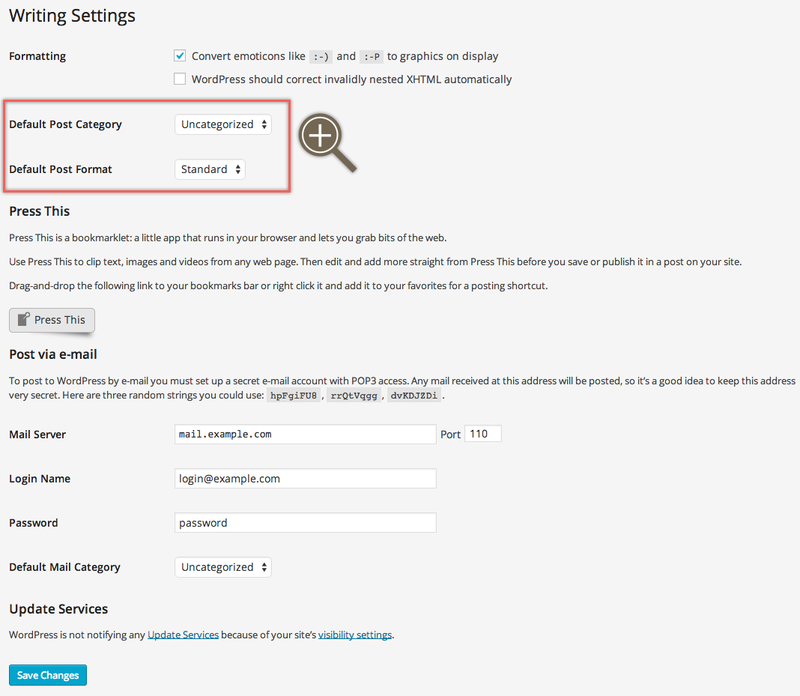 You can also select category and tag base for your WordPress blog under permalinks settings. Check out our dedicated articles on WordPress permalinks settings and resolution to various permalinks issues. Site title and tag line. WordPress URL and site URL. Setting membership and default role. Date and time format and week starting day. Setting default category and post format. Setting for post via email. Setting front page of your site as static page or latest blog posts. Number of posts to be shown on blog page and feed. Showing summary or full post on feed. Threaded commenting and setting display order. Email notification on new comment and comment moderation. Choose Permanent link structure for your site. Set category and tag base.